Beware this kibbeh is addictive! I suggest you make twice as much to go round. Mash the potatoes while still warm, it will be easier to blend them. Serve as a starter or a bite size appetiser on grilled pitta bread. Press the potatoes through a ricer. Grate the onion, place in a sieve and strain. Rinse and strain the burghol and place it in a large bowl. Adding a pinch of salt, crush the walnuts to a paste with a food processor or by hand in a heavy pestle and mortar. Combine the the burghol with the grated onion, the spices and the walnut paste. Incorporate the mashed potatoes; add olive oil, lemon juice, water and knead to form a sort of soft dough; mix in the chopped parsley last. Divide the mixture into portions weighing each 100 g, form them like a rugby ball and place them in a serving dish. Garnish each portion with half a walnut and drizzle with extra virgin olive oil. 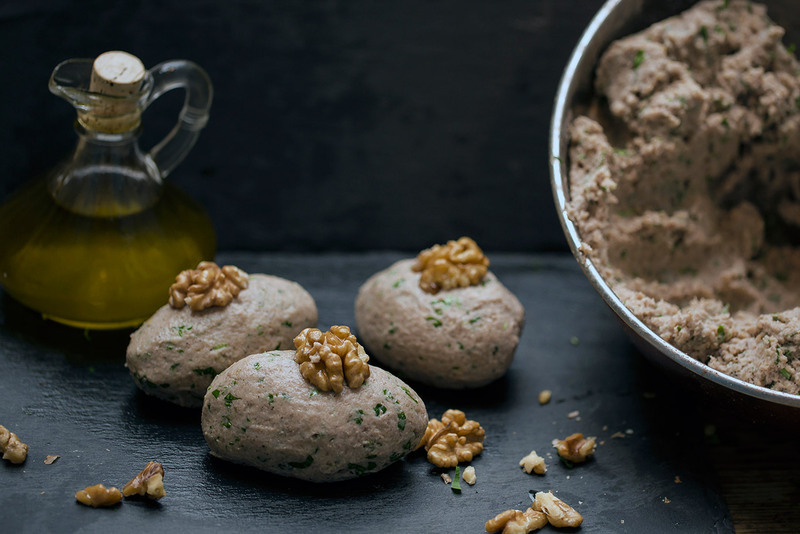 Walnut kibbeh will keep in the fridge for 3 days and is best served at room temperature. Yum! Cant wait to try it out! People here in the Chouf make potato kibbeh or pumpkin kibbeh, but i have never tasted that one! Is this one from a specific region? Great that you like it Joumana, it is actually quite moreish. I am not sure that it is regional, I think it may well be a new take on potato kibbeh.